This sweet cherub’s flower has a dazzling birthstone center—matching the stars on her heavenly dress! 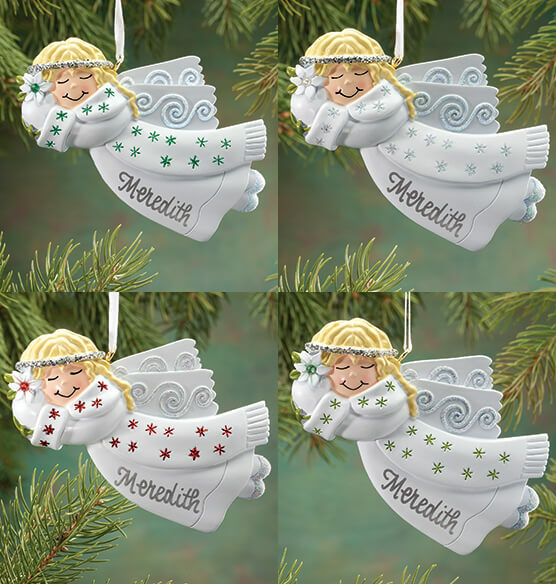 Personalized birthstone angel ornament's embellishments will match birthstone. Specify month. 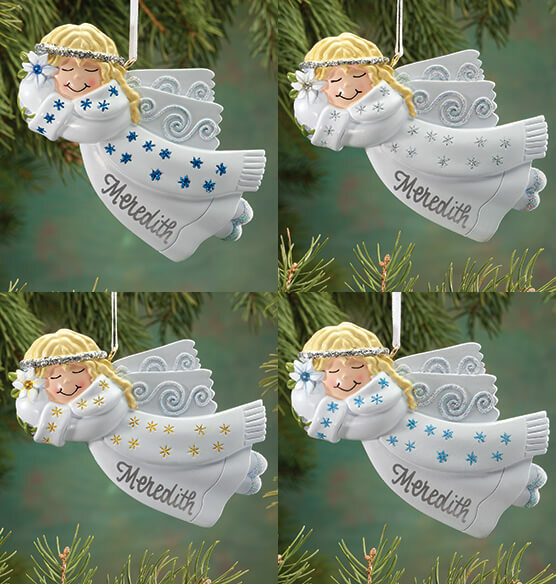 We’ll personalize birthstone angel ornaments in silver. Specify name; limit 1 line, 9 letters/spaces. Resin. 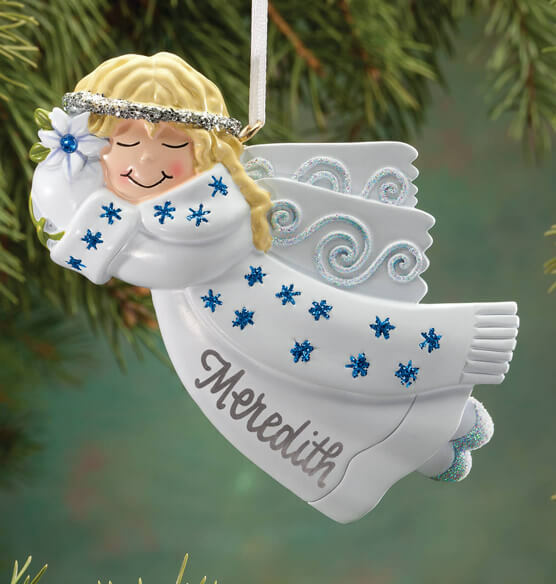 Personalized angel ornament is 4" wide x 2 1/2" high. Bought 2, one for each granddaughter, for Christmas 2015! These ornamentas are darling and I'm sure the girls will love them. I bought this ornament for a friends daughter I have no doubt she love it. Excellent ornamnt for Christmas or anytim vry durable and good price unique and pretty would recommend this to anyone you won't be disappointed. I bought 2 of these for my grandkids and they're even prettier in person than online. The birthstones really show up well. The names are nicely done and large enough to easily read. They're gonna love seeing these on the tree. Great for Hanging on our Christmas Tree!!!! I'm saving this to give to my Granddaughter for her Christmas tree. The angel is beautiful and I loved the blue Sept stones. I ordered this ornament for my Kentucky tree. So I ordered one for December with my Granddaughters name on it. I ordered it the first of the month and it didn't come in until a few days before Christmas. That was alright since it was for my tree. As usual an ornament from Miles Kimball that is wonderful. Well made, exactly as it looks on the webpage, and the perfect size. Stunning little angel. 13 yrs. ago I had a set of twins, unfortunately 2 mo. 21 days one of them passed away. I ordered these personalized angels to represent my angel baby and my living daughter and they are perfect. I bought this for my four-year-old granddaughter, she loved it, especially since it has her name on it. I have it hanging on my tree. Beautiful ornament for my Granddaughter. Her birthstone was for October. I ordered it at the first of December and I didn't get it until a few days before Christmas. Loved it but she only got to put it one the tree on Christmas eve. I loved this item. I ordered it for my great-granddaughter's first Christmas. Her parents thought it was so special and will hang it on their tree for many years to come. Very attractive and detailed. Purchased for my granddaughters. Very pleased with purchase. Glad I bought this for my daughter! I purchased this precious personalized angle for a very close friend of mine. I'm sure she will love it as much as I do. Each year I buy my granddaughter 2 Christmas ornaments. When I saw this beautiful angel w/her birth stone, I looked no further. When it arrived, I was delighted, it is so very pretty & feminine. It is also delicate, yet strong enough to get it's meaning across. I was so pleased, that I got on-line & ordered another for my littlest angel. Thank Goodness the angel ornament was still available. It was a gift she loved. This angel is really sweet! I love the glitter and how the white goes well with the silver lettering. My granddaughter love this ornament! I bought this for my boss, who loves angels. I'm sure that she will love it. Made very well and should last for years. I have an ornament for each grandchild. They hang on the Christmas tree. I used this gift as a special occasion remembrance. Gift to a friend who "loves-Birthstone Angel" & called to tell me. I ordered four and am not disappointed. Had them engraved and the engraving is beautiful. I will be giving them as gifts for Christmas. Didn't cost much for such a wonderful gift. Unfortunately the personalization was spelled wrong, this is for my 8 year old granddaughter. I'm disappointed because on the order form its spelled correctly. This was a Christmas item and received late. The other 3 that I ordered that were supposed to arrive well before Christmas have still never come and we are now into the new year. So that was very disappointing. I ordered this birthstone angel for JUNE. What I received was whatever the white birthstone is. This was a memorial for my aunt who passed away. Still a cute ornament, just not what I ordered. Somebody should pay better attention. Beautiful, But arrived in 3 Pieces! I have 3 days before Christmas to glue this beautiful ornament together. (And hope that the repair isn't noticeable! It's a gift for a close family friend. For it's size, it's very heavy! It must be brittle, to have arrived broken into 3 pieces. Wish me luck. I'm hopeful of being able to give this, as an ornament on a Xmas Gift, this week. It is the closest to the other family oridements I have had in the past. 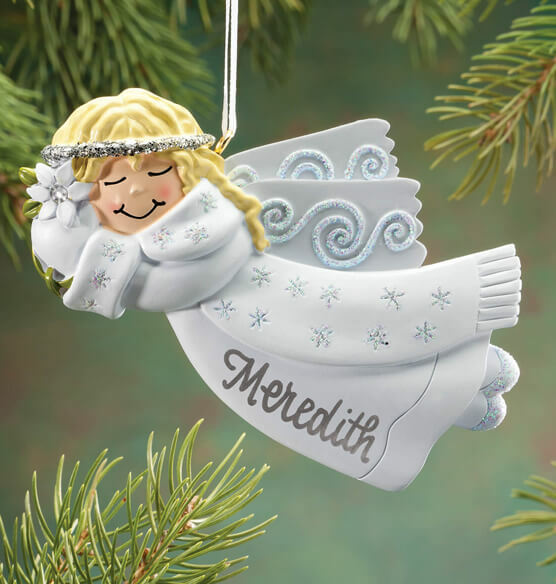 I wanted an angel that could be personalized with my sis’ name in her memory.